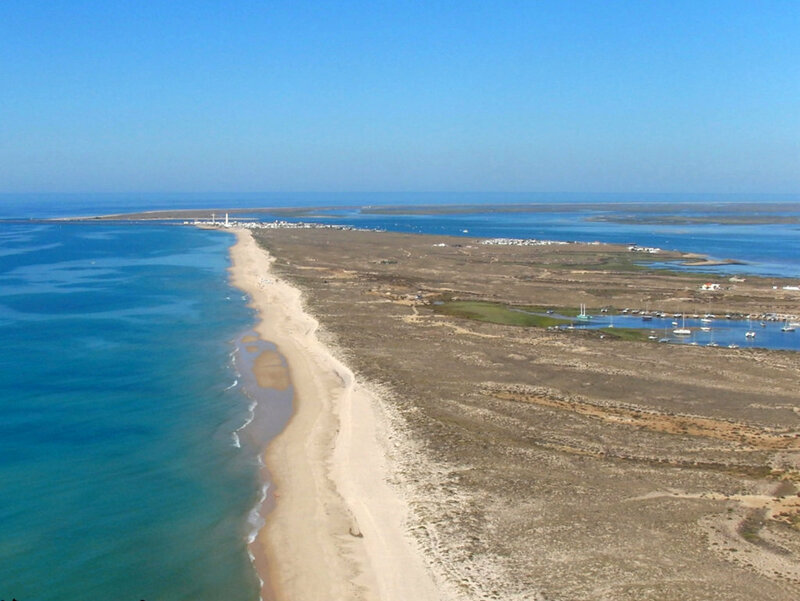 Ilha da Culatra is marvelous island in the natural park of Ria Formosa, near the town of Olhão. 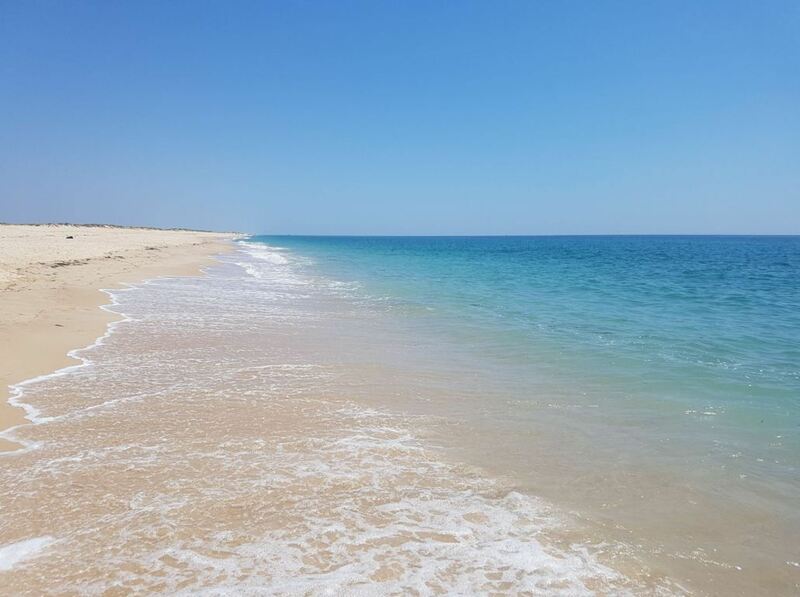 The main attraction of Culatra Island is its beautiful beach, which can be considered as one of the most beautiful beaches of the Algarve. It is the perfect destination for a day trip. 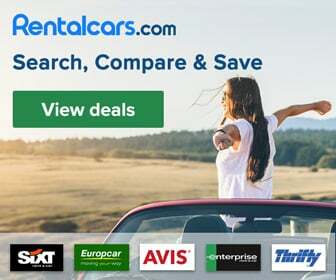 Are you looking for a good reason to book your flight to the Algarve? Then watch the short video below. It gives you a glimpse of the beach on Culatra Island. 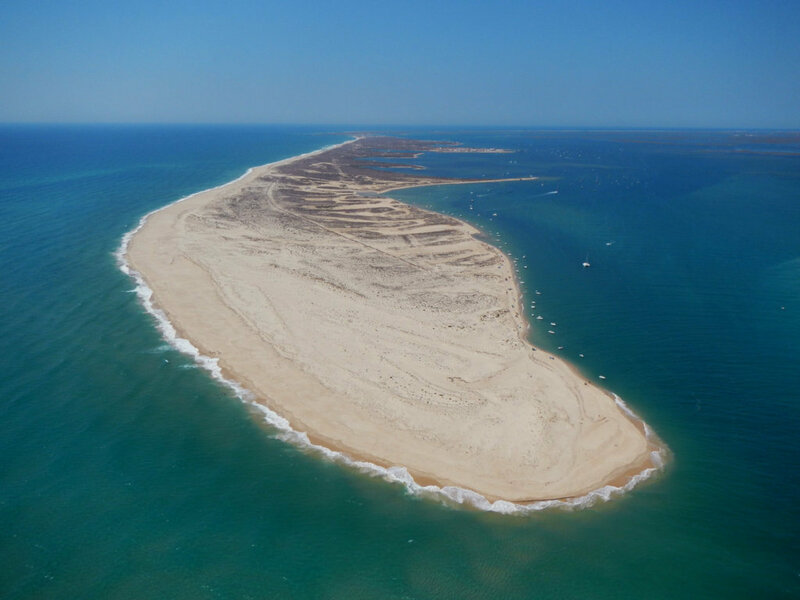 Ilha da Culatra is one of the islands that separates the sea from the natural park of Ria Formosa. The island is about 6 kilometres long. The width of Culatra Island ranges from 100 to 900 meters. The island is permanently inhabited by around 1000 people, who mainly live from fishing and tourism. Culatra (on the northern banks). Culatra is a small fishing village that is mainly inhabited by fishermen. Farol (in the west). Farol is a small village with a lighthouse (Farol means lighthouse in Portuguese). This part of the island is sometimes called Ilha do Farol (Farol Island). This name suggests it is another island than Ilha da Culatra, but actually it is a different part of the same island. Culatra and Farol are the only villages on the island. Hângares. This is named after an old hangar for marine seaplanes. Hângares is a more quiet area, with very little infrastructure and few tourists. All three of these parts have a great beach. In that sense they are quite comparable to one another. It is easy to reach Culatra and Farol by ferry. However, if you want to go to Hângares, you will have to walk there. There are no roads for vehicles on the island. It is only possible to explore the island by foot, on wooden paths. There are some idyllic small fishermen houses on the island. Seeing them gives you an idea of how the local fishermen live. If you want to see the traditional Portuguese fishermen lifestyle, this is the place to be. 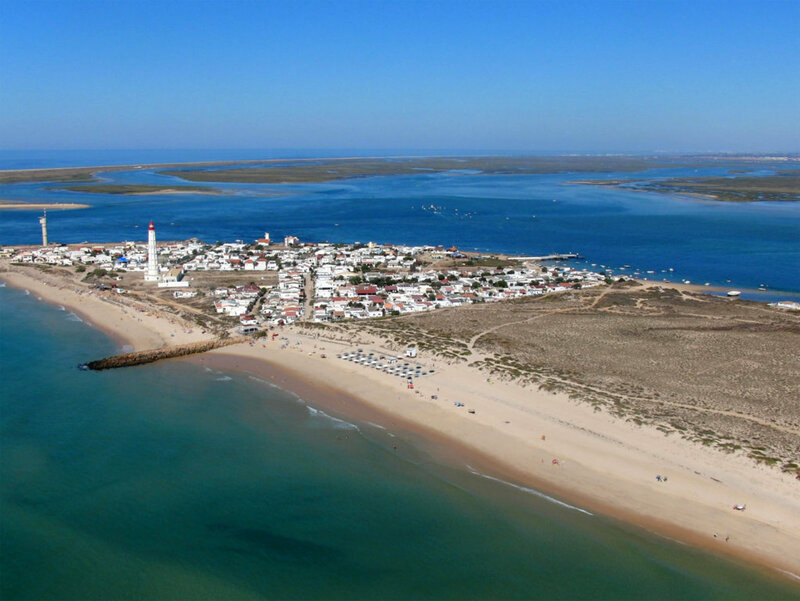 The beach of Ilha da Culatra is one of the two main beaches of Olhão. The other one is Ilha da Armona. 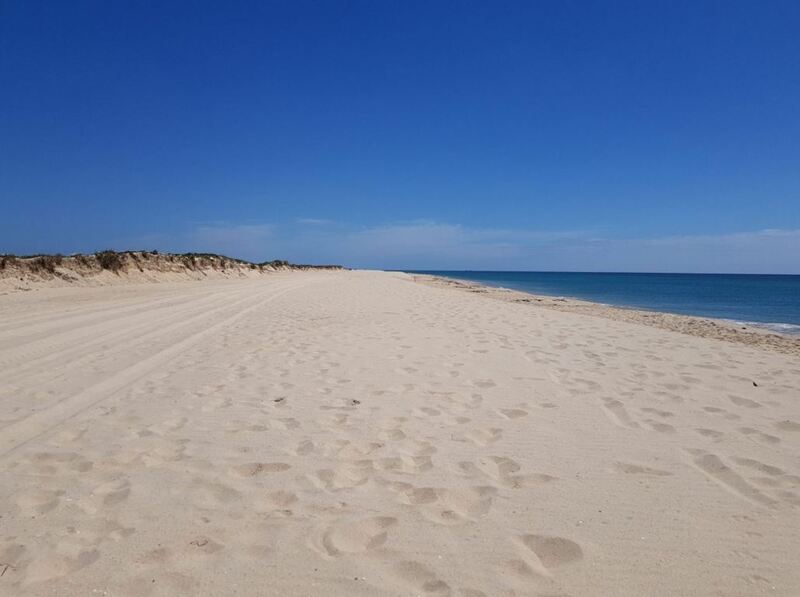 The beach of Culatra Island stretches from Farol all the way to Culatra and then even further. Basically, it is one huge beach. The beach is situated on the side of the ocean and is surrounded by dunes. This is very different from the cliff backed beaches that you can find in other parts of the Algarve. The beach is quite sandy and the sand is fine. The sea water here is transparent and exceptionally clean. This is great for diving and snorkeling. You will be able to see a nice variety of flora and fauna underwater. Waves are generally small, but can be rougher on some days. Be warned that the water near the island can be quite cold. Culatra Island is mainly visited by Portuguese families for a day trip, but also by some tourists who are looking for a more quiet beach. The beaches of Culatra Island are not so crowded as many of the beaches on the mainland. This is because the island can only be reached by ferry. This is great if you don’t like to share a beach with thousands of others. You will always have enough space on this beach. 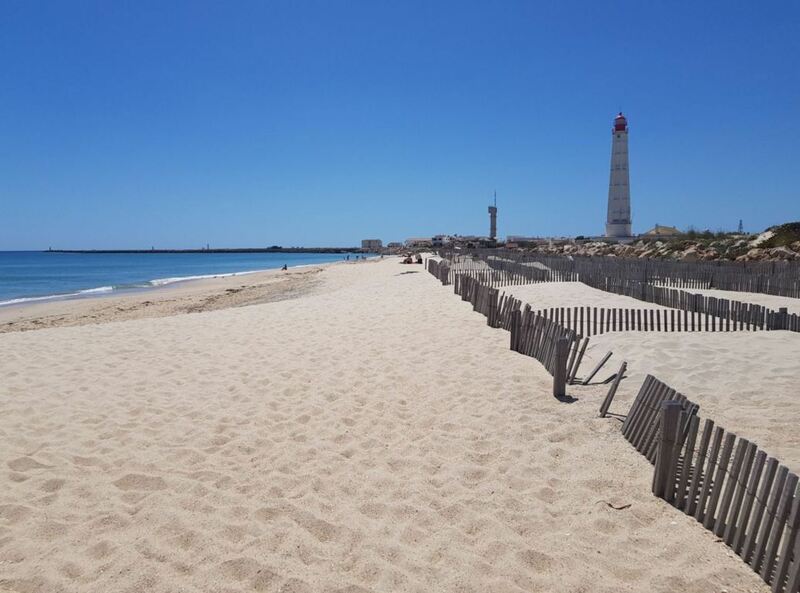 Most of the people arriving on Farol stay on the beach near the village of Farol. And most of the people arriving in Culatra, stay on the part of the beach following the boardwalk. If you are willing to walk a bit, you will find yourself alone on the beach, even in the summer. The beach is popular all year round, but attracts more people in the summer. However, Ilha da Culatra and Farol are also great to visit in the winter. There are many interesting sea creatures living in this area. For example there are dolphin watching tours in the Ria Formosa. Occasionally you will be able to spot dolphins while sitting on the beach. In august 2018 there were even people who spotted and photographed orcas near Ilha da Culatra. The beach on Ilha da Culatra stretches for several kilometres. The beach reaches as far as the eye can see. This makes the island perfect for long beach walks. You can also collect many shells along the way. Ilha da Culatra is a great place for hiking. In fact, you can walk from the village of Culatra all the way to the village of Farol. There are two ways to do this: along the beach, or on a wooden path in the dunes. The walk is about 4 kilometers. You will see a variety of vegetation and wildlife and will truly appreciate the beauty of this island. 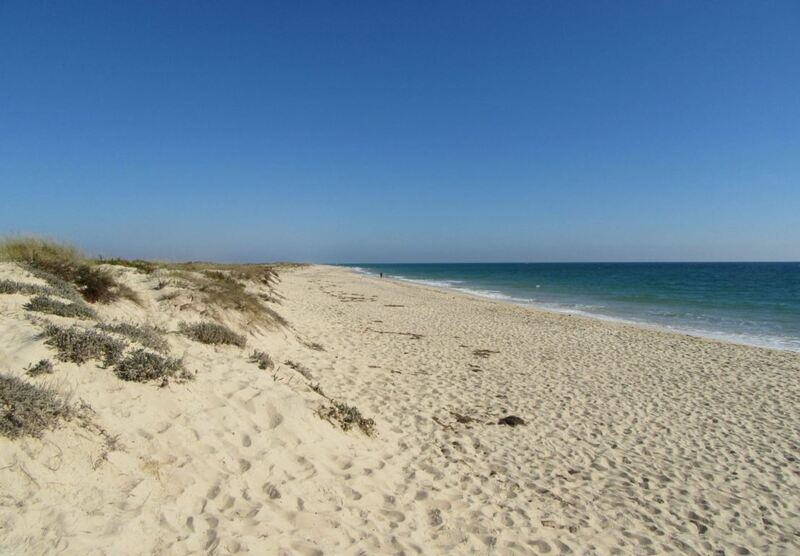 You can for example arrive on Culatra, walk to the beach, and then walk along the sea to the west, all the way to Farol. 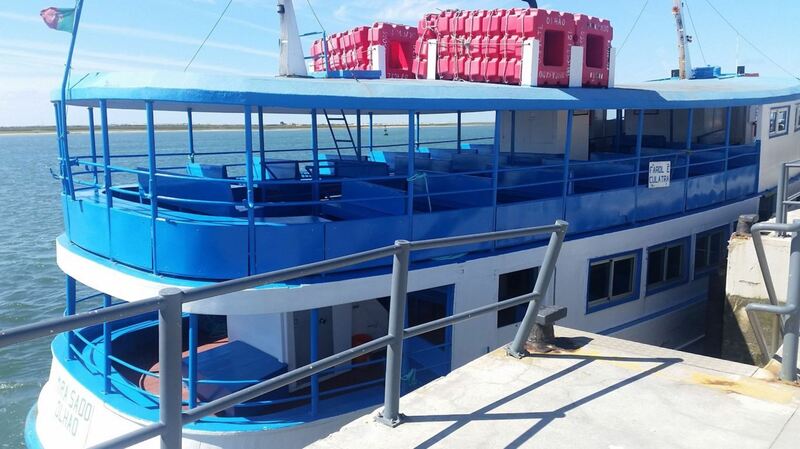 There you can enjoy a delicious seafood lunch and take the return ferry to Olhão. The following video shows you more about walking on Ilha da Culatra. Departing from Olhão, the journey takes about 30 minutes to Culatra and 45 minutes to Farol. Departing from Faro, the journey takes about 30 minutes to Farol or 40 minutes to Culatra. You can buy the tickets for the ferry at the docking station. Tickets cost around € 4 per person for a round trip. You can also find the timetable of the ferry here. Make sure to check when the last ferry leaves Culatra. After all, you don’t want to be stuck on the island after the last ferry has left. 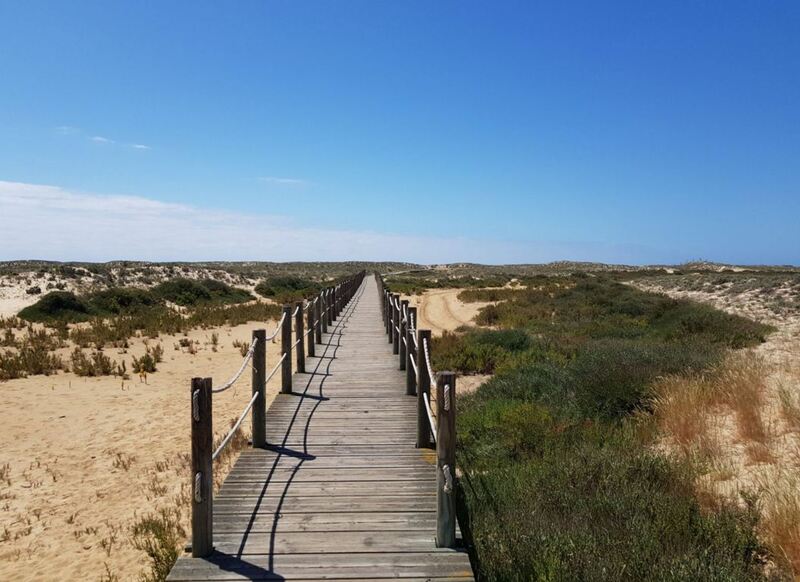 During the journey itself you will be able to see the natural park of Ria Formosa. The ferry ride is very relaxing. Chances are you will see different kinds of birds during the journey, including flamingos. When you arrive in Culatra, you will have to walk quite a bit to get to the beach. The walk is around 20 minutes. This can be hard if you are travelling with small kids. You will first walk through the small village of Culatra. You will find several seafood restaurants and a supermarket here. After the village you will have to follow a long boardwalk to get to the beach. Just follow the sound of the sea and you won’t be disappointed. 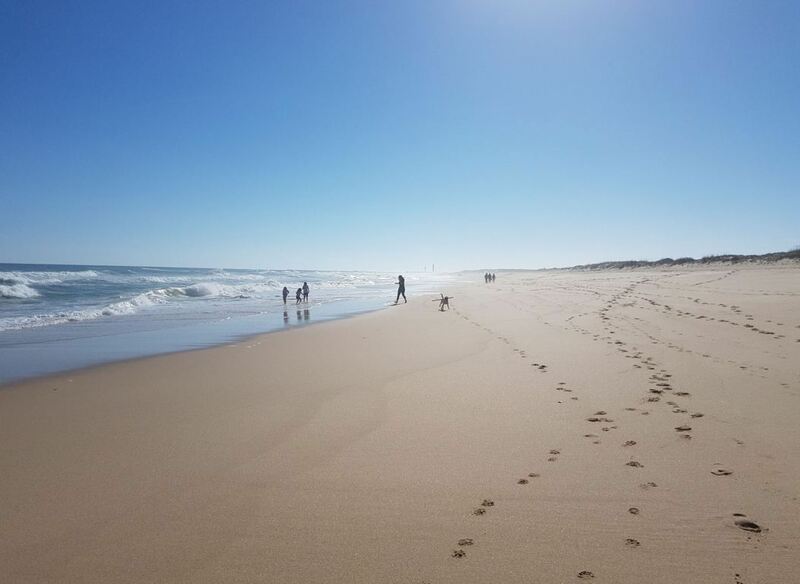 When you arrive in Farol, the walk to the beach is only 5 to 10 minutes. A Taska da Culatra. 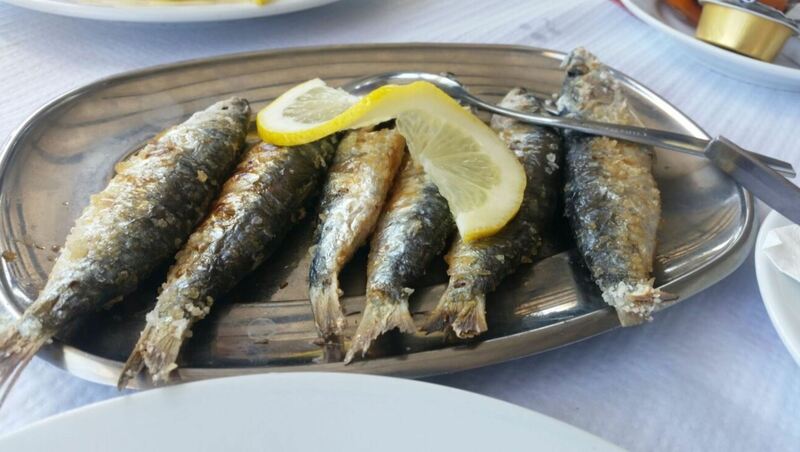 This Portuguese restaurant in the village of Culatra specializes in fresh fish and seafood. It is a great place to have lunch. Restaurante À do João. This restaurant serves Portuguese food and makes amazing fish. The service is great and the view is fantastic. Located in the part of Farol. MarAmais. This restaurant/beach bar near Farol has a great vibe and nice food. Located right on the sand. It is the perfect place to sit, relax, read a book and enjoy your holiday in the Algarve. Real Marina Residence. These luxury apartments are very spacious and comfortable. The property has a nice swimming pool on the rooftop. Apartamentos Sol & Ria. 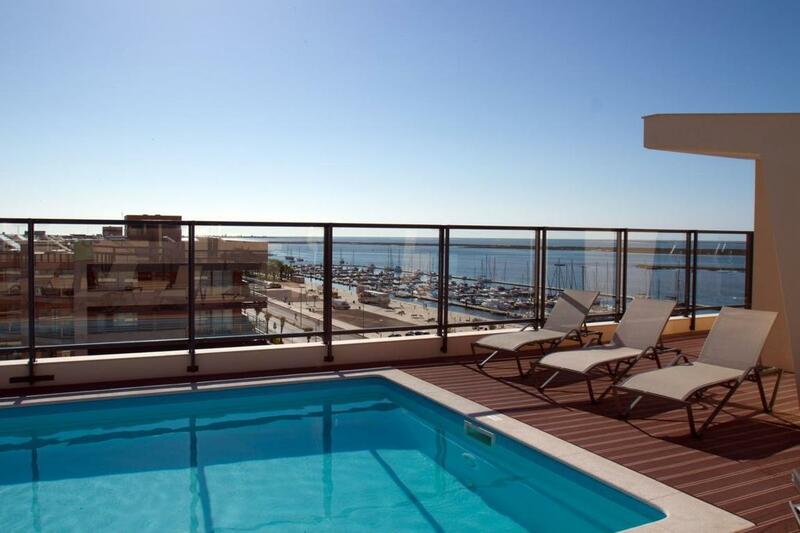 These modern apartments offer everything you need for a great holiday in the Algarve. Clean rooms and great location. There is a penthouse apartment on the top floor, which is especially wonderful. Real Marina Hotel & Spa. This 5 star hotel is truly amazing. Several swimming pools and many welness facilities. Beautiful rooms and wonderful staff, that will go the extra mile to make your stay as perfect as possible. After the busy summer season of last year, we recommend to book your hotel now, as it will probably sell out. 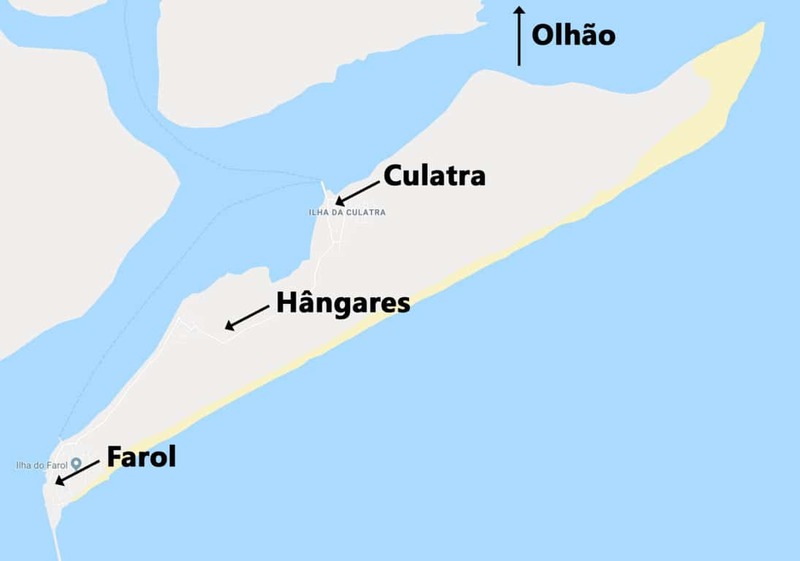 Below you can find a map with the location of hotels in Olhão. By changing the date of your holiday, the map will show you the current prices. Ilha da Culatra is a perfect destination for a day trip. However, if you are near Olhão, there are many other things you can enjoy. For example, there are great excursions that will make your holiday extra memorable! For example, think about exploring the beautiful scenery of the Ria Formosa. Below you can see some of our recommended excursions near Olhão. All the facilities on the island are concentrated around the villages of Culatra and Farol. For example, there is an eco bar on the beach. However, we recommend you to bring your own food and drinks if you visit the island for a day trip.